Galaxy Alpha -What is the advantage of using Ultra Power Saving Mode? Ultra power saving mode extends the standby time and reduce battery consumption. •Limits access to default apps and to various other apps that can be selected from a list. •Deactivates the mobile data connection when the screen turns off. •Deactivates the Wi-Fi and Bluetooth features. The estimated maximum standby time shows the approximate amount of time. remaining while the device is not being used before the battery power runs out. can add more apps to use. 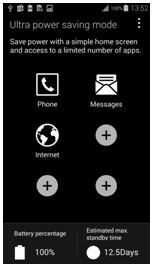 How to set up the S-Health app in Galaxy Alpha?